Originally published in 1990, this title presents work that bridges social psychology and organizations. The primary goal is understanding, but that goal has two opposite sides: understanding organizations by bringing to bear the concepts and methods of social psychology (along with other social sciences), and understanding and developing social psychology by confronting it with the phenomena of actual organizational life. As such the authors break down some traditional stereotypical barriers between the academic world and the business world, between theoretical and applied research, between laboratory and field, and between various academic sub-disciplines. The result is a series of challenging forays into new research domains from which provocative ideas and provocative phenomena emerge. Preface 1. 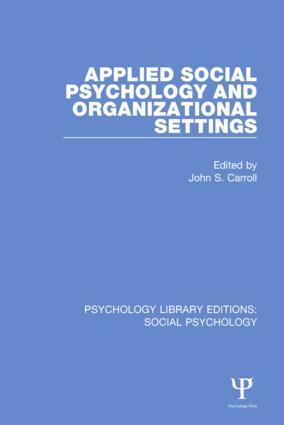 John S. Carroll Social Psychology in Business Organizations 2. Max H. Bazerman, Elizabeth Mannix, Harris Sondak and Leigh Thompson Negotiator Behavior and Decision Processes in Dyads, Groups and Markets 3. Joel Brockner and Jerald Greenberg The Impact of Layoffs on Survivors: An Organizational Justice Perspective 4. Tom R. Tyler and Robert J. Bies Beyond Formal Procedures: The Interpersonal Context of Procedural Justice 5. Deborah Gladstein Ancona Top-Management Teams: Preparing for the Revolution 6. Robert G. Lord and Karen J. Maher Perceptions of Leadership and their Implications in Organizations 7. Arthur D. Shulman, Robyn Penman and David Sless Putting Information Technology in its Place: Organizational Communication and the Human Infrastructure 8. Jolene Galegher Intellectual Teamwork and Information Technology: The Role of Information Systems in Collaborative Intellectual Work. Author Index. Subject Index.